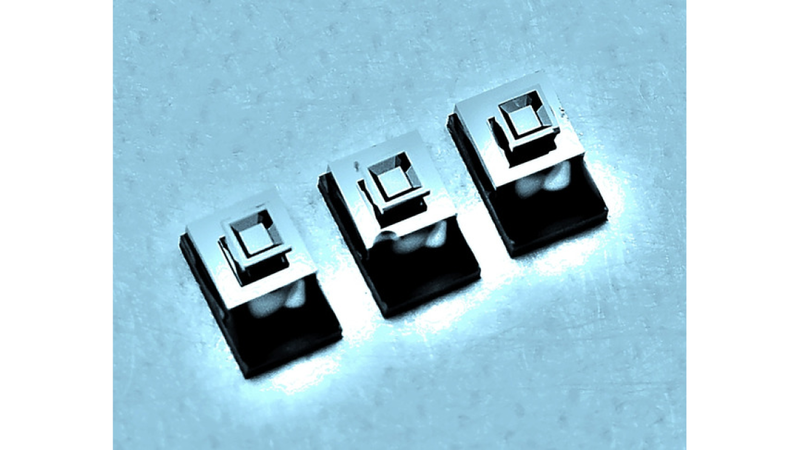 The outstanding long-term stability, the high reliability and measuring accuracy as well as the chemical resistance of the media-contacting surfaces are the hallmarks of the new MEMS pressure sensors of CiS. Without protective buffer or seal in the form of oils or elastomeric layers, the sensor elements produced in a plasma depth etching process are directly usable, e.g. in medical applications or in micro-reactors of biotechnology. The absolute pressure sensors presented here with an edge length of 1 mm and embedded piezoresistors typically provide 20 µV/hPa sensitivity with measuring accuracies of up to 0.001 hPa. Due to the high resolution, the sensors are suitable for navigation in indoor areas or for monitoring tasks, such as the fall detection of patients. With the plasma depth etching process, shapes of cavities and chip contours can be realized, which are not possible with wet etching processes. Even round cavities and sensor chips are possible for special applications. The structure of the functional sensor element is achieved by wafer-level packaging (WLP), whereby, for 3D integration, flip-chip connections and silicon vias (through silicon VIAs - TSVs) are used. In case of corresponding quantities, the production costs are by all means comparable to those of conventional technologies. Further projects are already being planned on the basis of the developed production technology. This includes the connection of the WLP sensor modules to conductor tracks of ceramic substrates with glass solder, the realization of multi-chip modules and the development of high-temperature piezoresistors, coatings and mounting techniques. The vertical integration of the sensor chips onto customer-specific ASICs is generally done without bonding wires by means of corresponding interposers with through-hole contacts in TSV technology.